Our Opticline SPC measuring stations are ideal for quality control, and make the optical, non-contact measurement of shaft-shaped workpieces much easier. 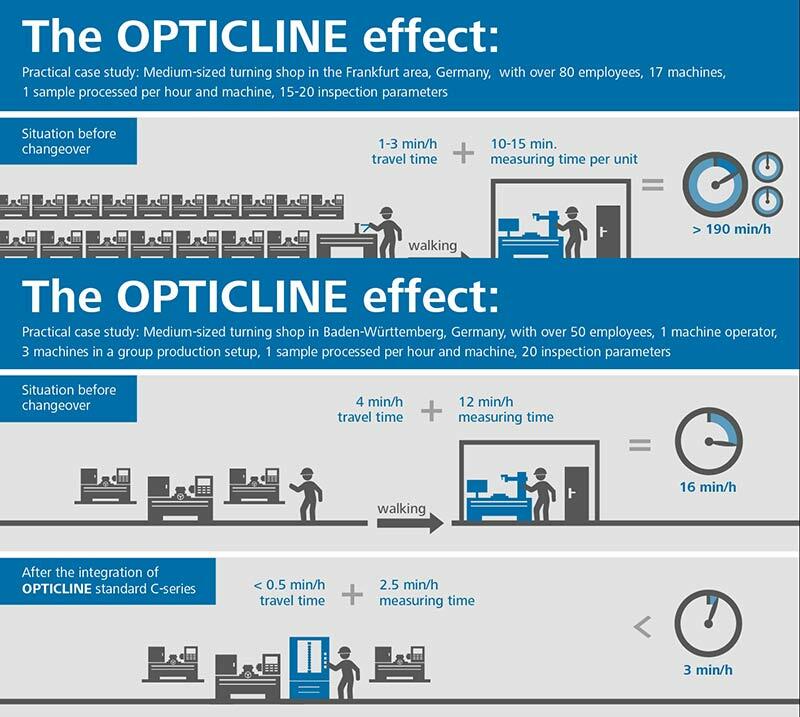 The measuring stations in the Opticline product range from Jenoptik are perfect for the demands of optical shaft measurement. The systems can be used in manufacturing itself, or in the measuring room. They even function without any problems in the tough production areas of an industrial environment. The SPC measuring stations are fitted with various interfaces for statistical process control (SPC). These allow extremely efficient monitoring of the manufacturing process, and allow rapid intervention where necessary. This ensures that you can produce workpieces of a consistently high quality. The measuring systems are simple to operate, allow non operator-dependent measurement results, and deliver easy to understand measurement results with analysis functions where required. Precise and versatile: Complete, high-resolution, and precise measurement of various measurement tasks in seconds with no operator influence on the measurement results. Efficient: Carry out operator checks at the machine,monitor workpieces during manufacture, and respond quickly. Convenient: Intuitive test plan creation and operation, clear and transparent results display, minimal training required. Flexible: Suitable for a wide range of workpieces, minimal setup times, and effective in flexible production. Reliable and suitable for manufacturing: Intelligent and automated monitoring of the measuring system, robust construction, temperature compensation, no setting master required for daily use. Automotive industry: Measurement of turbochargers, engine valves, pistons, camshafts and crank shafts, gear shafts and drive shafts. Turned and ground parts producers: Measure shaft-shaped, largely axially symmetrical workpieces. Medical technology: Measure implants, bone screws, and rotating instruments. Quality assurance starts directly in the production process. Therefore our Opticline systems are even more robust, even more resilient, even more precise - and can be placed in the middle of your production environment. That is what we stand for in industrial metrology. Cut routes, bring outlay down to a minimum, save on rework and reduce the sources of error. Put your trust in maximum ease of operation and the longest possible service life. For maximum reliability in production. 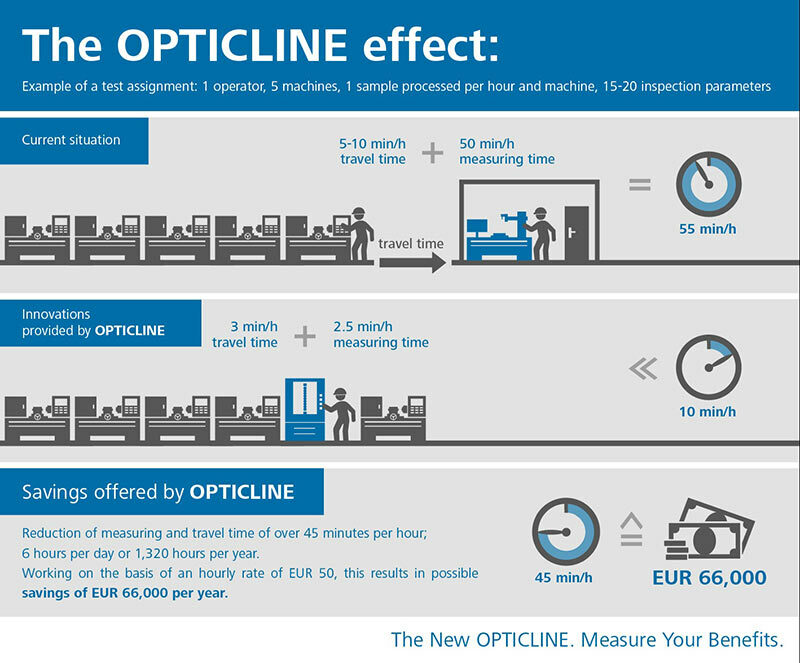 Absolute precision within the shortest test times - our new Opticline systems combine a flexible approach to measurement with maximum user-friendliness. In doing so, they take speed to a whole new level of quality and offer a whole new approach to complex applications. Whether it is creating test plans or performing complicated measurement runs, our evaluation software provides you with reliable support for whatever task you need to complete. For quality assurance with the maximum level of reproducibility and precision. This guarantees the maximum level of quality for your production process, ensuring your company can achieve long-term economic success. 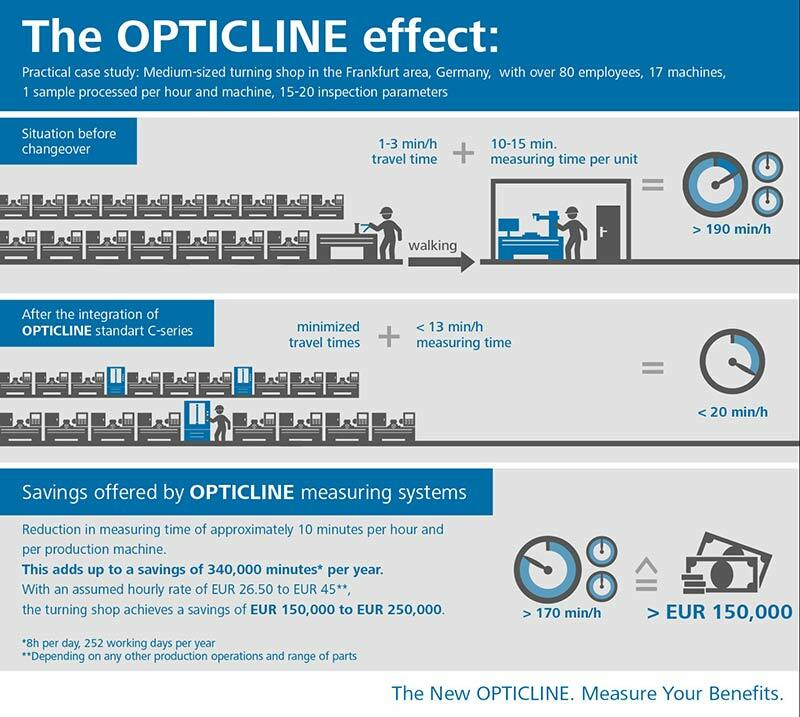 The New Opticline. Measure Your Benefits. The high-precision measuring systems from Jenoptik are used for safe and reliable optical shaft measurement. They are extremely well-suited to manufacturing, ensure optimal quality control. The machines are extremely robust and, in addition to use in the measuring room, are ideal for use in industrial environments. The measurements deliver stable results with repeat accuracy. This means you can test your workpieces even during manufacturing, ensuring maximum quality. We offer various models within the Opticline C-series. These differ from each other in terms of their workpiece capacity. You choose the measuring system that precisely meets your requirements. Smaller and larger workpieces of up to 900mm in length can be measured to the micrometer. system for workpieces with diametersof up to 320 mm. Adaptation to your integration requirements– horizontal or vertical design. Split-second measurements, even with very large workpieces. Available for operator self-inspection and fully-automated use. C-series Opticline shaft measuring systems are available in different variants, making it possible to handle a wide range of shaft types and measuring tasks with a consistently high level of quality.